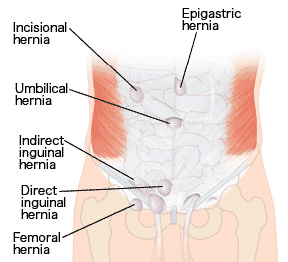 Hernias are an extremely uncomfortable condition that many Americans face. Whether they are congenital (present at birth) or acquired (developed over years of normal wear and tear on the intestinal walls), hernias cause serious pain that can hamper a person’s quality of life. Hernias will not disappear on their own. Fortunately, with advances in modern medicine, hernia repair has become a fairly straightforward procedure, especially with the introduction of laparoscopic techniques. Learn more about laparoscopic hernia repair in the Austin area, and contact Cedar Park Surgeons, PA to schedule a surgical consultation with our team. Hernias, or tears or weaknesses within the abdominal wall, occur when a portion of the intestines or fatty tissue presses up against the lining of the wall, producing a bulge. Hernias are extremely painful and sometimes inhibit normal body movement and daily activity. Our Cedar Park surgeons can perform laparoscopic surgery for ventral or inguinal hernias, using a special “mesh” substance to repair the area. The surgery is minimally invasive and, in most cases, patients can return home the same day. If you are interested in hernia repair, or another procedure such as colon cancer surgery, please contact Cedar Park Surgeons, PA, serving Austin and outlying communities. Our Cedar Park surgeons can perform laparoscopic surgery for ventral or inguinal hernias, using a special “mesh” substance to repair the area. The surgery is minimally invasive and, in most cases, patients can return home the same day. Patients who have laparoscopic treatment generally experience minimal post-operative pain and less scarring than with traditional “open” surgery. Certain hernia repair candidates are not suitable for laparoscopic procedures. These include patients who are obese or have had prior abdominal surgery that left a lot of scar tissue. A qualified, experienced surgeon can help determine if you are a suitable candidate for laparoscopic hernia repair. If you are interested in laparoscopic hernia repair, please contact Cedar Park Surgeons, PAserving Austin and outlying communities. Our qualified and experienced surgical team would be happy to schedule a consultation with you to discuss hernia repair.